Gillian is haunted by the disappearance of her little girl two years ago. A devastating fire burned down their home, but she remains convinced her daughter survived. Ten year old Tom lived by a neglected church. Is he the only one who sees the strange, solitary child playing there? And what is she trying to tell him? There's a new vicar in town - Harry. But menacing events suggest he isn't welcome. What terrible secret is this town hiding? I am really behind in my reading and in my posting. I am actually reading a different kind of books nowadays...and am very slow in in social and casual read. Currently having two books with me...one in the car for the boring moments while waiting for traffic to clear and another one on my bedside table which I can managed only about 3 chapters each night. At the rate I am going, I probably will only read 1 book per month....horrors!! 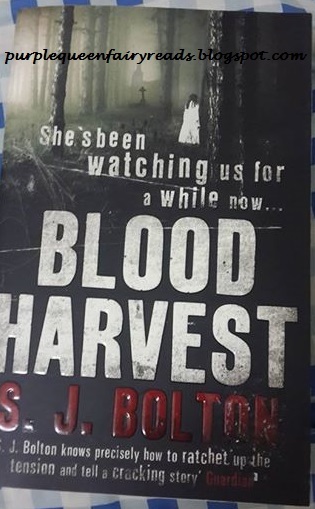 Anyway, Blood Harvest was actually read quite a while ago and I forgot all about it because I have since sold off the book. It is a great book...it's creepyly great and greatly creepy. The suspense started right at the first chapter and it really builds up. There was a point in the book where I was so creeped out I dare not go down to the kitchen for a cup of water (being quite late in the night and everyone has turned in). And then, there's a part in the book when the vicar is in the church and he was reading out some verses and a voice joined him towards the end and ended the verse for him...that would be something that I won't forget in quite a long time! So, if you have a chance to read Blood Harvest, grab it. If you wanted something scary, Blood Harvest delivers!